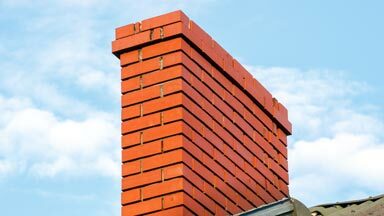 Anatomy of a Chimney | Chimneys | Chimney | Kent Chimney Inc. When scheduling chimney repairs, it might help to know the anatomy of a chimney. That way, you will be able to speak knowledgeably with one of our chimney contractors about the problem. Knowing how different chimney parts function will also help you keep up on maintenance. There could be as many as 22 parts to your chimney, but we’ll only go through the main parts here. To make this easier, we’re going to follow the paths that fire, smoke, and ashes take through your home’s fireplace system. Light a fire in the firebox. You notice the flames lick through the wood and engulf the hearth. You’re not worried about the flames spreading to your house because of the hearth extension, which is installed in the floor in front of the hearth and made out of a heat resistant material like tile or brick. The smoke billows through the space between the firebox and the chimney damper, which is called the throat. When the fireplace isn’t in use, you are able to close the chimney damper with a lever or pulley to prevent animals like squirrels or raccoons from living in your chimney. Closing the chimney damper also prevents small animals from falling into your chimney and getting trapped. If your chimney cap is designed to prevent this, you don’t have to worry about it. The smoke quickly leaves the throat and enters the smoke chamber. The shape and design of the smoke chamber safely compresses smoke so it’s ready to exit your home through the chimney flue above. A flue liner prevents your chimney from being a fire hazard. A chimney crown (also called a chimney wash) is the topmost part of your chimney. The seal prevents water from seeping in between the flue liner and the chimney walls. Once the final ember has died and the heat is gone, open the door to the ash dump. The ashes will fall into the ash pit where they can be safely removed via the cleanout door in the basement. You’ll want to clean out the ash pit frequently to prevent a risk of fire. The chimney repair contractors at Kent Chimney Inc. are dedicated to helping homeowners like you keep chimneys in working condition. If you are interested in our chimney cleaning or chimney repair services, give us a call at (616) 949-7722.